For the first time in over a decade, Canada’s Food Guide has been updated. The “rainbow” graphic featuring four distinct food groups that many of us grew up with, has been replaced by a simple photograph of a dinner plate- half of which is covered with bright, nutrient-rich fruits and vegetables. The new food guide eliminated the four food groups altogether, while recommending that Canadians consume plant-based foods more often, while reducing their intake of processed foods, meat, sugar, and saturated fats. Chances are, you’ve likely considered adding more fruits and vegetables to your diet before the new food guide was announced. Home-made salads are an excellent option to fill half your plate with fruits and vegetables. They’re quick to make and are easily customizable to you and your family’s taste preferences and dietary requirements. Unfortunately, many store-bought salad dressings are loaded with salt and sugar. You wouldn’t want to off-set your healthy salad with an unhealthy dressing. A simple alternative to store-bought salad dressings is to make your own. 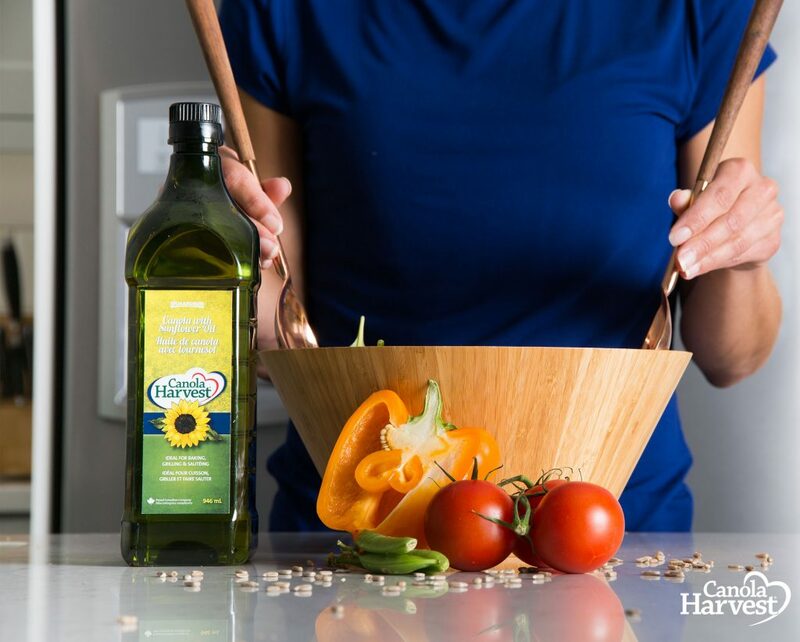 Not only does creating your own salad dressings put you in control of the added salt and sugar content, but home-made salad dressings are also packed with freshness and flavour. The foundation of most salad dressings are simply oil and vinegar with herbs or spices. The four salad dressing recipes below use our four plant-based oil blends as a base. 1. Combine all ingredients in a bowl and whisk until blended. 2. Use immediately, or store in the refrigerator, covered, for up to 4 days. Note: directions apply for each recipe.